The study aim was to retrospectively compare pulmonary subsolid nodules observed on Computed Tomography (CT) scans with findings on follow-up CT images after more than 2 y. The Institutional Review Board has approved this study. We retrospectively reviewed 203 subsolid nodules found in 169 patients. Findings on CT images were evaluated in terms of nodule size, development of a new internal solid component, and the type of relationship between the nodules and blood vessels. Nodules from 61 out of 169 patients were resected and pathological findings were recorded. The frequency of growth of subsolid nodules was 30.0% (61 out of 203 nodules). For nonsolid nodules, the frequency was 27.0% (51 of 189); for part-solid nodules, the frequency was 71.1% (10 of 14). Nodule growth was significantly associated with type of nodule (nonsolid or part-solid), initial size, development of a new solid portion, and type of relationship between nodules and blood vessels. The average volume doubling time was 873 d for nonsolid nodules and 793 d for part-solid nodules. Of the 189 nonsolid nodules, 67 were resected (19 invasive adenocarcinomas, 14 Minimally Invasive Adenocarcinomas (MIAs), 25 Adenocarcinomas In Situ (AIS), 6 Atypical Adenomatous Hyperplasia’s (AAHs), and 3 benign conditions). Of the 14 partsolid nodules, 5 were resected (3 invasive adenocarcinomas and 2 AIS). During long-term follow-up, 30.0% of subsolid nodules had grown. Of the grown nodules that were resected, 26.5% were MIAs and 58.8% were invasive adenocarcinomas. Subsolid nodule, Ground-glass nodule, Ground-glass opacity, Computed tomography, Pulmonary, Lung cancer, Adenocarcinoma, Adenocarcinomas in situ. With the progress of medical imaging technology and the broad application of Computed Tomography (CT), Ground- Glass Opacity Nodules (GGNs) are commonly identified on chest CT images . GGN is a radiological finding on CT, consisting of hazy opacity that does not obscure the underlying bronchial structures or pulmonary vessels . Pulmonary Subsolid Nodules (SSNs) can be classified into nonsolid GGNs and part-solid GGNs . Part-solid GGNs are nodules that present both ground-glass components and solid components through which the underlying lung parenchymal architecture cannot be visualized. Except in a few benign conditions such as focal interstitial fibrosis, focal haemorrhage, or inflammation, GGNs usually constitute invasive pulmonary adenocarcinoma, Minimally Invasive Adenocarcinoma (MIA), Adenocarcinoma In Situ (AIS), or Atypical Adenomatous Hyperplasia (AAH) . A number of recommendations for the management of SSNs have been presented [5,6]. Management of SSNs in the lung, particularly persistent SSNs, remains controversial [7-10]. Fleischner Society guidelines for SSNs recommend no requirement for follow-up surveillance using CT examinations for nonsolid GGNs less than 5 mm, and suggest that persistent nonsolid GGNs larger than 5 mm should be followed-up by yearly CT surveillance for a minimum of 3 y . Several studies have also investigated the natural history of SSNs, reported its indolent clinical course, and various clinical-radiological characteristics that can be used to predict the growth interval of these nodules, but a few of them had pathological diagnosis in cases of SSNs that had no growth during their follow-up period [11,12]. There have been very few long-term follow up studies on SSNs. SSNs grow very slowly or remain unchanged, and it is very difficult to decide whether to resect them at the time of the first CT scan. If the nodules are conservatively observed on follow-up CT scans, we need to determine when or whether to resect them. In this study, we retrospectively analyzed the progression of persistent pulmonary SSNs (>2 y after the initial scan) on thin-section CT images, evaluated the risk factors for size increases, and analyzed the correlations between size increases and histopathological results. We reviewed all SSNs recorded on thin-section CT scans at Shanghai Pulmonary Hospital from Feb 2009-2016, including both nonsolid GGNs and part-solid GGNs. Patients with SSNs who fulfilled the following criteria were selected: (1) Had undergone follow-up CT examination for more than 2 y after the initial scan; (2) Nodule size<3 cm; (3) Ground-Glass Opacity (GGO) proportion>50%. Nodules with decreased size or attenuated nodules were excluded. Moreover, patients who had a diagnosis of lung cancer, thyroid cancer, or breast carcinoma were excluded. This study was conducted in accordance with the declaration of Helsinki. This study was conducted with approval from the Ethics Committee of Shanghai Pulmonary Hospital. Written informed consent was obtained from all participants. We used a 40-row CT scanner (Brilliance-40, Philips Medical Systems and USA). The scanning conditions were tube potential, 120 kVp; tube current, 200 mA; pitch, 0.69. The patients were scanned from the apex pulmonis to the base of the lung, and images were reconstructed into two forms: 5 mm thick sections at 5 mm intervals and 1 mm thick sections at 1 mm intervals. The lung window was set at a window width of 1500 Hounsfield Units (HU) and a window level of -450 HU; the mediastinal window was set at window width of 450 HU and a window level of 50 HU. CT images were analyzed by two radiologists who had 8 and 7 y of experience, respectively. Information about the nodules including their location, consistency, maximal diameter, and maximal diameter of the solid component (in part-solid nodules), and whether a new solid component developed was recorded. Nodule growth was defined as an increase of more than 2 mm from the maximal diameter of the nodule on the initial CT screening. The correlation between nodules and blood vessels was recorded and the correlation was divided into two types: Type I, vessels circumventing nodule lesions or passing through the lesions without any morphological changes and did not present increasing coarse deformation or other changes; Type II, vessels in the lesion were distorted or rigid or vessels passing through the SSNs with lumen broadening or vessel gathering. Days between the initial CT screening and follow-up CT screenings were calculated. The Volume Doubling Time (VDT) was calculated using Schwartz’s formula : Td=t log2/(3log (Dt/D0)), where Td equals the doubling time, Dt is the maximal diameter of a nodule at the last CT scan, D0 is the maximal diameter of the nodule at initial CT scan, and t equals the time from the initial CT scan to the final CT scan. Any differences in opinion between radiologists were discussed and solved by consensus. Pathological specimens were obtained from patients who underwent video-assisted thoracoscopic surgery. The specimens were diagnosed by two pathologists who had 8 and 12 y of experience, respectively, following the standard classification of lung adenocarcinoma by the International Association for the Study of Lung Cancer/American Thoracic Society/European Respiratory Society . All differences between the pathologists were resolved by consensus. We calculated the means and medians. The Pearson χ2 test and Fisher’s exact test were used for categorical data, and an independent sample t test or the Mann-Whitney U test was used for numerical data. A P value less than 0.05 indicated statistical significance. SPSS16.0 was used to perform all statistical tests. From February 2009-2016, 496 250 patients underwent CT screening, and SSNs were identified in 16 746 patients; among them, 169 patients with persistent SSNs who were followed-up for more than 2 y and did not have a history of lung cancer, thyroid cancer, or breast carcinoma (including 203 nodules: 189 nonsolid nodules and 14 part-solid nodules) were enrolled in the study (Figure 1). Among 169 patients, 113 were women (66.9%) and 56 were men (33.1%), with an average age of 59 y (range, 24-84 y). The majority (147 of the 169 patients (87.0%) had a single SSN and 22 patients (13.0%) had more than one nodule. Figure 1. Design of this study. A total of 81 of 203 nodules (39.9%) were located in the right upper lobe, 19 nodules (9.4%) were located in the right middle lobe, 31 nodules (15.3%) were located in the right lower lobe, 55 nodules (27.1%) were located in the left upper lobe, and 17 nodules (8.3%) were located in the left lower lobe. In total, 142 of 203 nodules (70.0%) remained stable and 61 nodules (30.0%) grew. Among the part-solid nodules, 10 of 14 (71.1%) lesions grew, and in 9 of 10 lesions, both the size of the nodule and the solid component increased, while in 1 of 10 lesions, the size of the nodule increased but the size of the solid component remained stable. Of 189 nonsolid nodules, 51 (27.0%) grew, and in the growth group, 13 of 51 (25.5%) lesions developed a new solid component, while in the stable group, 2 of 138 (1.4%) lesions developed a solid component. The average follow-up time was 37 months (range 24-81 months). The initial nodule size differed significantly between the stable and growth groups (P<0.001). The type of SSN (nonsolid or part-solid nodule), new development of an internal solid component, and the type of relationship between the SSNs and blood vessels were significantly associated with nodule growth (P=0.002, P<0.001, and P<0.001, respectively) (Table 1). The average volume doubling time was 873 d in the nonsolid nodule group (range, 407-1957 d) and 793 d in the part-solid nodule group (range, 270-1632 d), but this difference was not significant between the groups (P=0.594) (Table 2). Table 2. Average volume doubling time. Resection was performed for 72 of 203 nodules (61 patients), including 38 in the stable group and 34 in the growth group (Tables 3 and 4). Among the patients, 20 patients had pathologic stage Tis, 4 had stage T1aN0M0 lung cancer, 17 had stage T1bN0M0, 9 had stage T1cN0M0, 2 had stage T2aN0M0, and 1 patient had a mediastinal lymph node metastasis and had pathologic stage T1cN1M0. Table 4. Part solid nodules. Pathological results were divided into three groups: Benign (organizing pneumonia), Precancerous lesions (including AAH and AIS) and Adenocarcinoma (include MIA and invasive adenocarcinoma). The pathological diagnosis differed significantly between the stable and growth groups (P<0.001). As of Aug 2016, all 61 patients in whom the nodules were resected were alive, with a mean follow-up time of 14 months (range 6-28 months). Two reports analyzed more than 100 GGO nodules, with a follow-up period of more than 2 y and reported growth rates of 10% and 26%, respectively [10,15]. The results of our study regarding nonsolid nodules (27.0%) were similar to those of these reports. Part-solid nodules have the potential for growth, but Yoshihisa and Tetsuya have demonstrated that some part-solid nodules remain unchanged for more than 3 y [16,17]. Our study found the proportion of unchanged nodules was 29.9% (4 of 14 part-solid nodules), and 2 of 4 unchanged part-solid nodules were resected and the pathological results were all AIS. In our study, we found that among 36 nonsolid nodules that remained stable for more than 2 y and that were subsequently resected, 20 (55.6%) were AIS and 5 (13.9%) were MIAs, and among the MIAs, the diameters of the nodules were 6.0 mm, 7.2 mm, 8.0 mm, 9.5 mm, and 11.6 mm. Only 2 of 36 nonsolid nodules were invasive adenocarcinomas with diameters of 11.1 mm and 19.0 mm. Among 20 AIS nodules, 5 (25%) grew less than 2 mm and 1 (20%) MIA nodule grew less than 2 mm over more than 2 y. Some SSNs that grow very slowly are easily mistaken to have no growth. The recommendations of the Fleischner Society are that for a persistent nonsolid nodule that is larger than 5 mm, yearly follow-up surveillance CT scans are required for a minimum of 3 y, but in some studies, a few lesions actually began growing after 3 y of observation, although these exceptional cases are in the minority [3,18,19]. We suggest the follow-up time should be extended and SSNs with growth less than 2 mm should be carefully observed and evaluated and should not be categorized into the non-growth group, and resection surgery should be taken into consideration. There were two different types of correlation between nodules and blood vessels. The type I correlation occurred more in stable group SSNs than in growth group and the type II correlation had a higher detection rate in growth group SSNs. Takashima et al. suggested fibro genic response was the main mechanism in the form of small blood vessels in type II correlation between nodules and blood vessels, endogenous and (or) exogenous tumor angiogenesis may also have an effect in lumen broadening of blood vessels . We should evaluate nonsolid nodules not only in terms of size and growth, but also in terms of their diameters, shapes, density, and blood vessel relationships. Volume doubling time is useful for evaluating the tendency of growth of SSNs. Hasegawa et al. reported that the mean VDT of nonsolid GGOs and part-solid GGOs were 813 d and 457 d, respectively, while Aoki et al. reported that the mean VDT of 6 AIS was 880 d [21,22]. Our study had similar results for nonsolid GGOs (873 d), but for part-solid lesions, our results were different (793 d). The volume doubling time of most growing nonsolid nodules is long, and they show an indolent course. In the growth group, 16 of 21 (76.2%) surgically resected nonsolid nodules were MIAs or invasive adenocarcinomas and among the rest, 5 of 21 (23.8%) were AISs. Nonsolid nodules can develop into invasive adenocarcinoma, and these nonsolid nodules detected by CT scans may include both clinically indolent and invasive tumors. The pathological diagnosis is significantly associated with nodule growth. The initial nodule size, type of SSN, new development of a solid portion, and type of relationship between SSN and blood vessels were significantly associated with nodule growth. Lesion size is a predictive factor of invasiveness for SSNs [23-25]. For nonsolid nodules, 35 of 51 (68.6%) SSNs with an initial size>10 mm grew, and the proportions of growing nodules<5 mm, 5-7 mm, and 8-9 mm were 9.5%, 7.6%, and 38.0%, respectively. These results support the recommendation that nonsolid nodules>10 mm should be considered for surgical resection [15,26]. We observed growth of a 3.4 mm and a 4.8 mm nonsolid nodule. The nodule that was initially 3.4 mm was resected, and the pathological diagnosis was invasive adenocarcinoma. Although recommendations of the Fleischner Society suggest solitary nonsolid GGNs measuring 5 mm or less do not require follow-up CT scans, we suggest 5 y or more follow-up CT scans should be considered . Our study has several limitations. First, it was retrospective in design and the follow-up times were heterogeneous. Second, 16,577 of 16,746 patients were followed-up or underwent resection after less than 2 y, or had a history of lung cancer, thyroid cancer, or breast carcinoma because of which they were excluded from this study. Third, 108 of 169 patients did not undergo surgical resection and did not have pathological results. Fourth, it was difficult to accurately evaluate stability or growth of these nonsolid nodules. In conclusion, nodule growth is important in distinguishing malignant nodules from benign and precancerous lesions; 30.0% of nonsolid nodules grew after findings on follow-up CT scans were evaluated for >2 y. Size (>10 mm), SSN type, development of a solid portion, and the type of relationship between an SSN and blood vessels could be useful in predicting nodule growth. Kobayashi Y, Sakao Y, Deshpande GA, Fukui T, Mizuno T, Kuroda H, Sakakura N, Usami N, Yatabe Y, Mitsudomi T. The association between baseline clinical-radiological characteristics and growth of pulmonary nodules with ground-glass opacity. Lung Cancer 2014; 83: 61-66. Hansell DM, Bankier AA, MacMahon H, McLoud TC, Müller NL, Remy J. Fleischner society: glossary of terms for thoracic imaging. Radiol 2008; 246: 697-722. Naidich DP, Bankier AA, MacMahon H, Schaefer-Prokop CM, Pistolesi M, Goo JM, Macchiarini P, Crapo JD, Herold CJ, Austin JH, Travis WD. Recommendations for the management of subsolid pulmonary nodules detected at CT: a statement from the Fleischner Society. Radiol 2013; 266: 304-317. 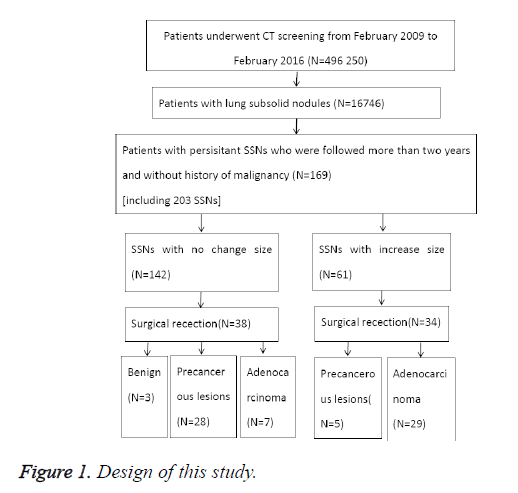 Asamura H, Suzuki K, Watanabe S, Matsuno Y, Maeshima A, Tsuchiya R. A clinicopathological study of resected subcentimeter lung cancers: a favourable prognosis for ground glass opacity lesions. Ann Thorac Surg 2003; 76: 1016-1022. Altorki NK, Yip R, Hanaoka T, Bauer T, Aye R, Kohman L, Sheppard B, Thurer R, Andaz S, Smith M, Mayfield W, Grannis F, Korst R, Pass H, Straznicka M, Flores R, Henschke CI. Sublobar resection is equivalent to lobectomy for clinical stage 1A lung cancer in solid nodules. J Thorac Cardiovasc Surg 2014; 147: 754-762. Kobayashi Y, Fukui T, Ito S, Usami N, Hatooka S, Yatabe Y, Mitsudomi T. How long small lung lesions of ground-glass opacity should be followed? J Thorac Oncol 2013; 8: 309-314. Yankelevitz DF, Yip R, Smith JP, Liang M, Liu Y, Xu DM, Salvatore MM, Wolf AS, Flores RM, Henschke CI. CT screening for lung cancer: nonsolid nodules in baseline and annual repeat rounds. Radiol 2015; 277: 555-564. Kim HY, Shim YM, Lee KS, Han J, Yi CA, Kim YK. Persistent pulmonary nodular ground-glass opacity at thin-section CT: histopathologic comparison. Radiol 2007; 245: 267-275. Kakinuma R, Muramatsu Y, Kusumoto M, Tsuchida T, Tsuta K, Maeshima AM, Asamura H, Moriyama N. Solitary pure ground-glass nodules 5 mm or smaller: frequency of growth. Radiol 2015; 276: 873-882. Lee SW, Leem CS, Kim TJ, Lee KW, Chung JH, Jheon S, Lee JH, Lee CT. The long-term course of ground-glass opacities detected on thin-section computed tomography. Respir Med 2013; 107: 904-910. Lee JH, Park CM, Lee SM, Kim H, McAdams HP, Goo JM. Persistent pulmonary subsolid nodules with solid portions of 5 mm or smaller: Their natural course and predictors of interval growth. Eur Radiol 2016; 26: 1529-1537. Kim H, Park CM, Koh JM, Lee SM, Goo JM. Pulmonary subsolid nodules: what radiologists need to know about the imaging features and management strategy? Diagn Interv Radiol 2014; 20: 47-57. Schwartz M. A bio mathematical approach to clinical tumor growth. Cancer 1961; 14: 1272-1294. Travis WD, Brambilla E, Noguchi M, Nicholson AG, Geisinger KR, Yatabe Y, Beer DG, Powell CA, Riely GJ, Van Schil PE, Garg K, Austin JH, Asamura H, Rusch VW, Hirsch FR, Scagliotti G, Mitsudomi T, Huber RM, Ishikawa Y, Jett J, Sanchez-Cespedes M, Sculier JP, Takahashi T, Tsuboi M, Vansteenkiste J, Wistuba I, Yang PC, Aberle D, Brambilla C, Flieder D, Franklin W, Gazdar A, Gould M, Hasleton P, Henderson D, Johnson B, Johnson D, Kerr K, Kuriyama K, Lee JS, Miller VA, Petersen I, Roggli V, Rosell R, Saijo N, Thunnissen E, Tsao M, Yankelewitz D. International association for the study of lung cancer/American thoracic society/European respiratory society: international multidisciplinary classification of lung adenocarcinoma. J Thorac Oncol 2011; 6: 244-285. Chang B, Hwang JH, Choi YH, Chung MP, Kim H, Kwon OJ, Lee HY, Lee KS, Shim YM, Han J, Um SW. Natural history of pure ground-glass opacity lung nodules detected by low-dose CT scan. Chest 2013; 143: 172-178. Lee HJ, Goo JM, Lee CH, Yoo CG, Kim YT, Im JG. Nodular ground-glass opacities on thin-section CT: size change during follow-up and pathological results. Korean J Radiol 2007; 8: 22-31. Kobayashi Y, Mitsudomi T. Management of ground-glass opacities: should all pulmonary lesions with ground-glass opacity be surgically resected? Transl Lung Cancer Res 2013; 2: 354-363. Hiramatsu M, Inagaki T, Inagaki T, Matsui Y, Satoh Y, Okumura S, Ishikawa Y, Miyaoka E, Nakagawa K. Pulmonary ground-glass opacity (GGO) lesions-large size and a history of lung cancer are risk factors for growth. J Thorac Oncol 2008; 3: 1245-1250. Matsuguma H, Mori K, Nakahara R, Suzuki H, Kasai T, Kamiyama Y, Igarashi S, Kodama T, Yokoi K. Characteristics of subsolid pulmonary nodules showing growth during follow-up with CT scanning. Chest 2013; 143: 436-443. Hasegawa M, Sone S, Takashima S, Li F, Yang ZG, Maruyama Y, Watanabe T. Growth rate of small lung cancers detected on mass CT screening. Br J Radiol 2000; 73: 1252-1259. Aoki T, Nakata H, Watanabe H, Nakamura K, Kasai T, Hashimoto H, Yasumoto K, Kido M. Evolution of peripheral lung adenocarcinomas: CT findings correlated with histology and tumor doubling time. AJR Am J Roentgenol 2000; 174: 763-768. Takashima S, Maruyama Y, Hasegawa M, Yamanda T, Honda T, Kadoya M, Sone S. CT findings and progression of small peripheral lung neoplasms having a replacement growth pattern. AJR 2003; 180: 817-826. Lee HJ, Goo JM, Lee CH, Park CM, Kim KG, Park EA, Lee HY. Predictive CT findings of malignancy in ground-glass nodules on thin-section chest CT: the effects on radiologist performance. Eur Radiol 2009; 19: 552-560. Eguchi T, Yoshizawa A, Kawakami S, Kumeda H, Umesaki T, Agatsuma H, Sakaizawa T, Tominaga Y, Toishi M, Hashizume M, Shiina T, Yoshida K, Asaka S, Matsushita M, Koizumi T. Tumor size and computed tomography attenuation of pulmonary pure ground-glass nodules are useful for predicting pathological invasiveness. PLoS One 2014; 9: e97867. Mao H, Labh K, Han F, Jiang S, Yang Y, Sun X. Diagnosis of the invasiveness of lung adenocarcinoma manifesting as ground glass opacities on high-resolution computed tomography. Thorac Cancer 2016; 7: 129-135. Godoy MC, Naidich DP. Subsolid pulmonary nodules and the spectrum of peripheral adenocarcinomas of the lung: recommended interim guidelines for assessment and management. Radiol 2009; 253: 606-622.